Kids won’t eat their veggies? Try these kid friendly juice recipes! A couple of months ago we bought a juicer and have been loving it! We bought the Breville Compact Juicer and so far it totally meets our needs. We didn’t need anything fancy and didn’t want to spend a ton so the Breville was right for us. The kids’ love to get involved and help out! They are learning so much about the different fruits and vegetables and eating healthy which is an added bonus. Many of you have asked what we put in our juices so here are a couple of recipes for you and some do’s and don’t that I found out through trial and error. I don’t recommend celery in the green juice. It has a VERY strong flavor. Keep it simple. Some people suggest adding extras such as ginger, I don’t. For me just the fruits and vegetables are enough. Sweeten it up. If you want the kids to drink it, you’re going to have to make it on the sweeter side. I recommend adding a sweet juicy fruit such as pineapple to all of your juices that your mixing up for the family. Super post, Rachael! We are also very happy with our Breville. It has been going strong for almost 2 decades. 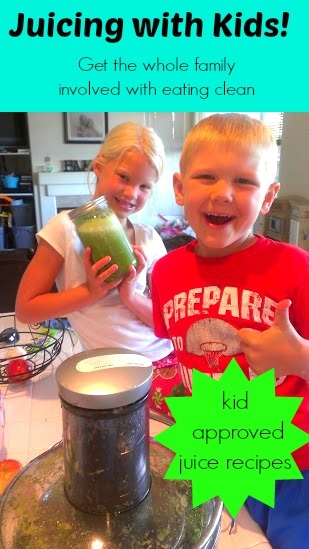 Juicing is so wonderful for kids. It can also be a great way to add some veggies they may not enjoy eating. You are right about keeping it simple. It is a good idea to start with tastes they like and are familiar with. You can then slowly add small amounts of new goodies as you go along. Beets are wonderful for giving the juice a nice pink color, but can be quite potent. So, a small chunk or two will do. Thank you! We recently tried adding beets and they LOVED them!